Many thanks for recommending the Mazda 3 automatic as our next car (we are 76 and 70 years old). However, when my wife arrived at the showroom she immediately fancied an SUV/crossover which I cannot shake her from. 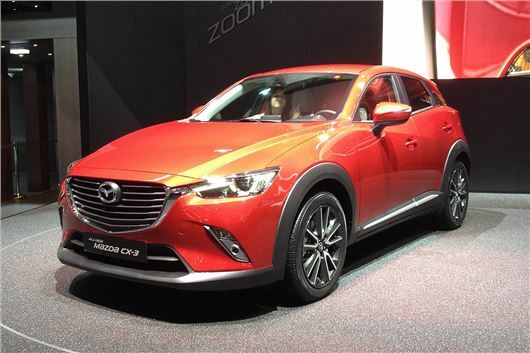 Can you suggest a viable alternative to the CX3, which has taken her eye that could be as good or better. We do small mileages. The CX3 is both good looking and good to drive. The Honda HR-V is more practical inside but the 1.5iVTEC CVT-7 isn't as good to drive as Mazda's 6-speed torque converter auto. The similar Toyota C-HR petrol hybrid auto is about to arrive and we will be testing that in 2 weeks time. You could consider a KIA Niro petrol hybrid automatic. A further alternative is a Suzuki Vitara S 1.4T Boosterjet auto, but if she likes the CX3 then she's making a good choice anyway. I've just received a Parking Charge Notice from Premier Park Ltd. for a 15min overstay whilst parking in Devon on 22nd October. The punishment doesn't seem to fit the crime at £100, with the usual reduction to £60 if paid within 14 days. Is this "reasonable" or do I pay up and shut up? I know you receive lots of parking queries but I'd be grateful for your wise counsel. The Supreme Court ruling last November says pay up. I warned this was coming with a dubious change in the law five years ago, but no one paid any attention. Last September I purchased a 2012 Volvo XC60 and its Pirelli P Zero Rosso 235/60 R18 103V tyres were fine in the unusually mild winter. This year though they are coming to the end of their life. I live in rural SW Scotland where we usually get frequent low temperatures and some snowfall and only the major roads are salted. I put winter tyres on my previous Volvo V50 which were excellent but can you please recommend a year round tyre which will provide good traction in most circumstances (as I would rather not have to buy two complete sets of tyres)? Also, my husband says that the AWD system will cope with slippery conditions but I maintain that a vehicle is only as good as the rubber it's riding on. Who is correct? Very happily, Michelin introduced Cross Climates in 235/60 R18 in May 2016. They are the best. Not only good in snow and cold weather conditions, they improve the ride of the car, are quieter, give better steering feel, and no penalty in fuel economy or wear. (I've just done a year and 13,000 miles on them.) Important to run at the lowest recommended cold pressures. My 2006 Focus 1.6TDCI estate has now done 78,000 miles and I know someone who would like it as a gift. I bought it at the auction under 2 years old with 12,000 miles. It has been a good car to drive, reliable and returns 50/52 mpg consistently. I am now looking to buy another car at BCA auctions, Blackbushe. I think another diesel might be troublesome owing to low mileage use, but I liked the fuel economy of the Focus diesel. A Fiesta 1.0 Ecoboost hatchback appeals to me as I understand that it can return a genuine 50+ mpg and appears roomy? I like to change my oil every 5,000 miles, so a DIY friendly car would be appreciated especially as I am now 77. Can you suggest any other model I could look at, at the auctions, probably an ex fleet car with approximately 20,000 miles? Readers submitting to Real MPG are averaging between 38.8mpg and 49.1mpg from the various different Fiesta 1.0 EcoBoosts: /realmpg/ford/fiesta-2013/ It’s not completely in the clear for reliability, though: /carbycar/ford/fiesta-2013/?section=good/ You're probably best off with a Honda Jazz 1.4iVTEC or maybe a Hyundai i10 or KIA Picanto. I went to my Lexus dealer who has serviced my GS450h since new. I liked the look of an RX450h. It was 6 months younger than my car but had done 17k more miles. Mine has done exactly 50k and is pretty much like new. So I was thinking that there would not be a great difference in the retail prices of the two cars. How wrong I was. Lexus wanted over £19k for their car and yet only offered me £7.5k for mine. Plus they tried to sell me gap insurance and a special waxing. Advice for fellow readers: never part-exchange your car and always think of offering 20% less than the garage is asking. The RX was a dearer car to start with. But your story goes to show how much the market has switched. It wants SUVs. It's not very interested in saloon cars. Had you been offering to swap an RX for a GS then it would have been a whole different ballgame. Further to my acknowledgement of your kind message, you may be interested to know that we have ended up with a Ford Mondeo estate. Much of this was because of the reaction of dealers. We rang a nearby Mazda dealer and were told that they had a petrol 6 automatic estate in stock. When we got there we found several diesel estates, but there turned out to be none with petrol engines. We were told that we would get a phone call when one was to hand. A later phone call to another dealer nearby got an answer that Mazda weren’t doing the 6 estate with a petrol engine now, but he would see if anything was in national stock. No follow-up so far. Initially, the nearest Skoda dealer said that it should be possible to source an ex demonstration base model petrol Skoda Superb automatic estate at an interesting price from stock, but a follow-up inquiry revealed that there was no such car available and I would probably have to wait three months to try one. I was put off the Skoda by your helpful mention of the dry clutch DSG that looks like trouble in any event. Croydon Ford dealers (Dees) was different. They said that they had an ex-Ford management petrol estate in stock, and we went to see it, but it turned out to have been sold. However, we were shown a diesel estate and the salesman took the trouble to take it to our house the next day and check that it could be parked there (we have an awkward access) and let us test drive it. We couldn’t see why Andrew English had taken against it. Your review was on target. However, the 2 litre petrol ex-Ford management estate car they then offered at £19,995 turned out to bb a September 2015, with 15 registration, not this year as we had earlier understood. Nevertheless, they seemed to be trying to meet our needs. I also looked at cars listed for sale on your web site and they included a May 2015, 3,700 ex-lease 2 litre petrol estate car in blue, my wife’s preferred colour, at Arnold Clark in Carlisle. Their Mr Paul Steedman answered the phone, confirmed that the car was in stock and arranged for a colleague to send a video of it. The offer made to us was to sell it at £17,985, to include a tankful of fuel at £75, one year’s VED at £210 and two years’ paint and upholstery protection at £207. We accepted this offer and took the sleeper to Carlisle to collect it yesterday. The hand-over was very thorough, we were taken on a familiarization drive by the man who had taken the video and who seemed to know the car extremely well as well as having some talent for teaching, and were introduced to the branch’s General Manager, who evidently knew about our transaction, probably quite small by the scale of the business the company seems to do. All were evidently interested in having happy buyers. Perhaps the thing that impressed me most was that they turned out to have spent only £60 on petrol and issued a cheque for £15 to set things straight as regards the price that they had put on the tank of petrol. I feel that the detour to get this car at this price in Carlisle was worthwhile and the negotiation with and reception at the garage were unexpectedly pleasant, leaving us with the sense that here were people in the motor trade with a very strong sense of square dealing. Many thanks. That was nice to read. I'm particularly pleased that you found some excellent Ford dealers and salespeople with the right attitude, Very refreshing.